LAS VEGAS – JUNE 30, 2015) — The International Parking Institute (IPI) has announced the three recipients of its 2015 Professional Recognition Program awards and all three are with Texas A&M University, College Station, Texas. The awards program was created to honor parking industry professionals who exemplify excellence and who are changing the perception of parking through their actions and organizational programs. 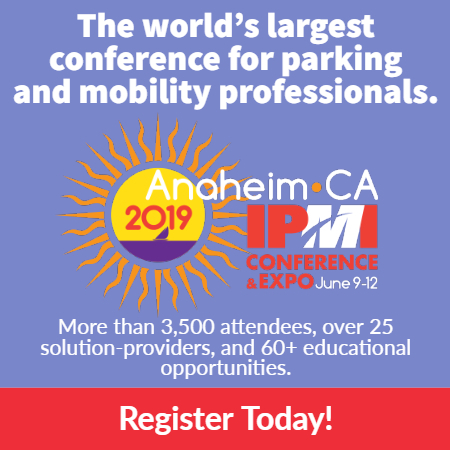 Nominated by their peers and selected by IPI’s Professional Recognition Program Committee, this year’s honorees have distinguished themselves in the parking profession with their leadership, dedication, and initiative. The 2015 James M. Hunnicutt, CAPP, Parking Professional of the Year is Peter Lange, Texas A&M University’s executive director of Transportation Services. Lange leads one of the largest parking, transportation, and fleet operations of any campus in the country. He and his staff of 154 regular employees and 337 students oversee 37,000 parking spaces in 138 lots and five garages, as well as transit and vehicle fleet operation and maintenance. The department’s transit unit transports more than 150,000 passengers per week, both on- and off-campus. The fleet unit leases some 700 university-owned vehicles and operates a full maintenance facility for the 1,200 vehicles and 3,000 pieces of equipment that serve the entire A&M system. Transportation Services issues more than 40,000 student and faculty/staff parking permits annually, and installs and maintains all traffic signs and markings on university streets. In addition to his regular duties, Lange builds relationships between the Transportation Services Department and a wide variety of constituent groups, including community leaders, faculty, staff, and students. An effective spokesperson on the issues and goals of the department, university, and community, he is adept at identifying and developing philanthropic, public, and constituent support for projects. He interfaces with all campus departments and city, county, and Texas Department of Transportation officials to ensure that construction and traffic management-related work on campus and the surrounding community is performed seamlessly. The 2015 Parking Supervisor of the Year is Parking Facilities Projects and Maintenance Unit Project Manager Clint Willis, the point person for all Texas A&M University construction projects involving Transportation Services. This includes virtually every renovation, construction, or modification that occurs within the ever-changing landscape of campus and the surrounding area. He reviews plans and specifications and recommends modifications to better suit the campus vision. A gifted leader, staff motivator, and role model, Willis represents the department at meetings with on- and off-campus stakeholders and works with city, county, local railroad, Texas Department of Transportation, and other officials involved in campus-related projects. He leads a team of 13 that oversees signage and barricades for a variety of special events; supervises a sign shop that produces hundreds of signs a year; manages the installation and maintenance of bus shelters; and ensures compliance with Americans with Disabilities Act (ADA) regulations. His additional accomplishments include the supervision of a new 2,700-space parking lot for football games and other events during inclement weather, and providing signage for 123 off-campus stops to support a new partnership between the university transit system and a local transit authority. He and his team shared the Division of Administration’s 2011 Awards in Excellence Team Award for their efforts to promote teamwork to accomplish a common goal. IPI’s 2015 Staff Member of the Year is Cindy Ishaq, a Texas A&M University parking services officer IV. In her oversight of daily operation and customer interface at the University Center Garage, she monitors space availability, assists customers and campus visitors with directions and proper operation of technology, adjusts computer counts to accommodate demand, operates and repairs gates and equipment, troubleshoots ticket equipment malfunctions, issues citations, provides motorist assistance, directs traffic, and assigns staff. Ishaq’s hard work and dedication, coupled with her character, temperament, and winning attitude, have earned her numerous awards. Beyond her regular duties, she leads a team of cashiers during events and a team in the university’s Controlled Access Network (SCAN) unit, and cross-trains parking officers to work with the management system. She also helps new employees learn the ropes, keeps her supervisors informed of upcoming challenges, and was elected by her peers to serve on the university’s Employee Advisory Committee, advising university leadership about issues of importance to the staff. IPI’s Professional Recognition Program Awards were announced at its 2015 Conference & Expo in Las Vegas, June 29-30.